Kill Uncle is the second solo studio album by English singer Morrissey, released on 4 March 1991 by record labels EMI and HMV. 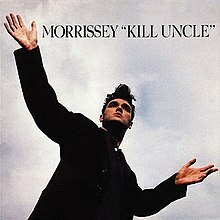 Kill Uncle was recorded when Morrissey was in a transitional phase. He had parted ways with producer Stephen Street but had not yet started working with his future long-term team of guitarists Alain Whyte and Boz Boorer. As such, the album, produced by Clive Langer and Alan Winstanley with most music written and guitar work done by Fairground Attraction's Mark E. Nevin, presents Morrissey singing to an unfamiliar style of music. On "Our Frank", Morrissey's lyrics describe "frank and open, deep conversations" that get him nowhere and leave him disheartened. The final verse, however, sees Morrissey singing "Won't somebody stop me from thinking? From thinking all the time. So deeply, so bleakly ...", which critic David Thompson interprets as indicating that the conversations he so dreads are in fact with himself. The song features some uncharacteristic production for the singer, with Morrissey's voice being overdubbed and echoed. "Asian Rut" is a tale about the murder of an Asian by three English boys in which Morrissey's vocals are backed only by strings and bass, plus sound effects, lending an eerie quality to the sombre narrative. The song continues the tradition of Morrissey examining English racism from a unique angle, first established with "Bengali in Platforms" on Viva Hate. "Sing Your Life", the third track on the album, features a drum loop which, featuring bass drums and toms but no snare drums, repeats itself throughout the track. The strings from the first two tracks are present in the song as well, and they rise and fall in a fashion similar to "Our Frank". The song has Morrissey instructing the listener on how to make a song, as he sings, "Walk right up to the microphone and name all the things you love, all the things you loathe." A rockabilly version of the song also exists, recorded live at KROQ in Los Angeles after Morrissey started working with new guitarists Boz Boorer and Alain Whyte. "Mute Witness", the fourth track, features piano backing composed by Clive Langer. The song is a somewhat farcical tale of an attempt to get information out of a witness who cannot speak at a trial. "King Leer" follows, an upbeat tune which has come under some criticism for its use of puns. "Found Found Found", another Langer track, is the only heavy song on the album. Morrissey sings that he's found "someone who's worth it in this murkiness" but again gives the song a twist at the end, complaining that this person is "somebody who wants to be with me ... all the time". In "Driving Your Girlfriend Home", a ballad, Morrissey tells of how he's driving the girlfriend of one of his friends home. He reveals that she asks him, "'How did I end up so deeply involved in the very existence I planned on avoiding?'" and that "She's laughing to stop herself crying." These outpourings are interspersed with driving instructions, and Morrissey tells us, "I can't tell her" what he feels about her and that the ride concludes with them "shaking hands goodnight so politely." The next track is "The Harsh Truth of the Camera Eye", often cited as Morrissey's most misunderstood song ever recorded. The lyrics are describing the "pain because of the strain of smiling" and the dichotomy between one's public image and private personality. The music consists of a carnival-like synthesizer and also features sound effects like that of a door slamming and a camera lens snapping, along with piano accompaniment. "The Harsh Truth of the Camera Eye" is followed-up by "(I'm) The End of the Family Line". The singer rues that he will never have children, an insult into the "fifteen generations ... of mine" that produced him. The lyrics are complemented by a subdued guitar backing, and the song features the kind of false fadeout that first appeared on such Smiths songs as "That Joke Isn't Funny Anymore". The album closes with "There Is a Place in Hell for Me and My Friends", a simple piano piece that again reflects the existential longing of the album and showcases Morrissey's torch song influence. Kill Uncle was released on 4 March 1991 by record labels EMI and HMV. "Our Frank", the album's lead single and opening track, reached No. 26 in the UK Singles Chart and No. 2 in the US Modern Rock chart. "Sing Your Life" was also released as a single, reaching No. 33 in the UK and No. 10 on the US. On 5 February 2013, Morrissey announced the reissue of the album along with a remastered version of his 1989 single "The Last of the Famous International Playboys", both to be released 8 April 2013. This was as part of a Morrissey reissue campaign by Parlophone Records. This version of the album includes three additional tracks and is available as a gatefold CD and heavyweight gatefold LP. The picture disc single and album feature new cover artworks. The press release mentioned that "the album has a revitalised quality, which accentuates some of its more subtle, experimental qualities and nuances; in particular, some of the more unusual musical styles which Morrissey explored for the first time". Kill Uncle has generally divided critics since its release. In his retrospective review, Stephen Thomas Erlewine of AllMusic panned the album, writing, "With Kill Uncle, Morrissey descended into the ranks of self-parody, churning out a series of pleasant but tired alternative jangle pop songs that had neither melody nor much wit to distinguish them", calling it "Morrissey's least distinguished record." Mark Hogan of Pitchfork wrote, "Kill Uncle positively revels in its own insubstantiality: Though often critiqued according to an indie tradition grounded in authenticity and personal expression, the album is best appreciated as a campy celebration of the decorative and artificial." All lyrics written by Morrissey; all music composed by Mark E. Nevin, except where noted. ^ Thompson, Dave. "Our Frank – Morrissey | Listen, Appearances, Song Review | AllMusic". AllMusic. Retrieved 10 February 2015. ^ Thompson, Dave. "Sing Your Life – Morrissey | Listen, Appearances, Song Review | AllMusic". AllMusic. Retrieved 10 February 2015. ^ Dingwall, John (18 April 2006). "The Worst Lyrics in the World..Ever – The Daily Record". Daily Record. Archived from the original on 9 June 2011. Retrieved 10 February 2015. ^ "LASID – King Leer". compsoc.man.ac.uk. Retrieved 10 February 2015. ^ "LASID – Driving Your Girlfriend Home". compsoc.man.ac.uk. Retrieved 10 February 2015. ^ "LASID – The Harsh Truth of the Camera Eye". compsoc.man.ac.uk. Retrieved 10 February 2015. ^ "Press Release: The Last of the Famous International Playboys: Special Edition Single; Kill Uncle: Album Remastered | True to You". True to You. 5 February 2013. Retrieved 7 February 2013. ^ a b Erlewine, Stephen Thomas. "Kill Uncle – Morrissey". AllMusic. Retrieved 10 February 2015. ^ Power, Tony (15 September 2004). "Morrissey: Kill Uncle". Blender. Archived from the original on 23 November 2005. Retrieved 18 November 2015. ^ Kot, Greg (7 July 1991). "The Smiths And Solo". Chicago Tribune. Retrieved 19 November 2015. ^ Farber, Jim (5 April 1991). "Kill Uncle". Entertainment Weekly. Retrieved 10 February 2015. ^ Hochman, Steve (24 March 1991). "Morrissey 'Kill Uncle' Sire/Reprise". Los Angeles Times. Retrieved 19 November 2015. ^ Quantick, David (March 1991). "Better Relate Than Never". NME. ^ a b Hogan, Mark (12 April 2013). "Morrissey: Kill Uncle". Pitchfork. Retrieved 10 February 2015. ^ Snow, Mat (April 1991). "Morrissey: Kill Uncle". Q (55). ^ Felder, Rachel (22 August 1991). "Morrissey: Kill Uncle". Rolling Stone. Archived from the original on 26 October 2009. Retrieved 10 February 2015. ^ Christgau, Robert (7 May 1991). "Consumer Guide". The Village Voice. Retrieved 19 November 2015. ^ "British album certifications – Morrissey – Kill Uncle". British Phonographic Industry. Select albums in the Format field. Select Silver in the Certification field. Type Kill Uncle in the "Search BPI Awards" field and then press Enter.